Thanks to the Meraux Foundation, the second annual Cook-Off for the Coast played out beautifully on Saturday, February 9th, 2019. CWPPRA was one of many outreach and educational groups hosted at Docville Farm in Violet, LA for an afternoon of good food, good music, and great enthusiasm for coastal restoration. All profits raised by the event went to Chalmette High School and Nunez Community College coastal restoration organizations which will use the funds to continue propagating and planting black mangroves in St. Bernard Parish and installing artificial oyster reef breakwaters just north of Comfort Island east of the current delta. We were set up next to our partner CPRA and under the same tent as Louisiana Master Naturalists of Greater New Orleans, the Louisiana Department of Wildlife and Fisheries, and the LSU AgCenter. Across the lot from us were Restore the Mississippi River Delta, CRCL, and various other restoration-minded groups. The theme for this year’s cook-off was wild game so all the food that was prepared had some kind of wild game in it, including tuna, oysters, hog, etc. Each of the cooking groups brought something unique to the table, including duck tacos, crawfish eggrolls, and deer/hog gumbo. As the public got tastes of the coast, they could wander through the exhibition of restoration/protection groups. At our table we had our #ProtectOurCoast poster series and stickers, some relevant issues of WaterMarks, and activity books for our younger visitors. Visitors could also compete in Wetland Jeopardy. 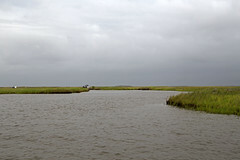 After learning about coastal issues and restoration efforts, visitors could enjoy more food or go into the dance hall where Michot’s Melody Makers were playing their traditional Cajun music. As the day came to a close, everyone gathered in the dance hall to award the best dishes as decided by the public. Awards were given for the best overall dish as well as best dish in 3 categories: Crawl, Fly, and Swim. With so many good contenders, the decision must have been difficult for the voting visitors. We would like to congratulate all the participants for getting involved with such a meaningful cause and preparing such delicious food. We’d like to thank the visitors and other exhibitors, as well as the Meraux Foundation, for the opportunity to share our love of wetlands and food- we cannot restore our coast without them.